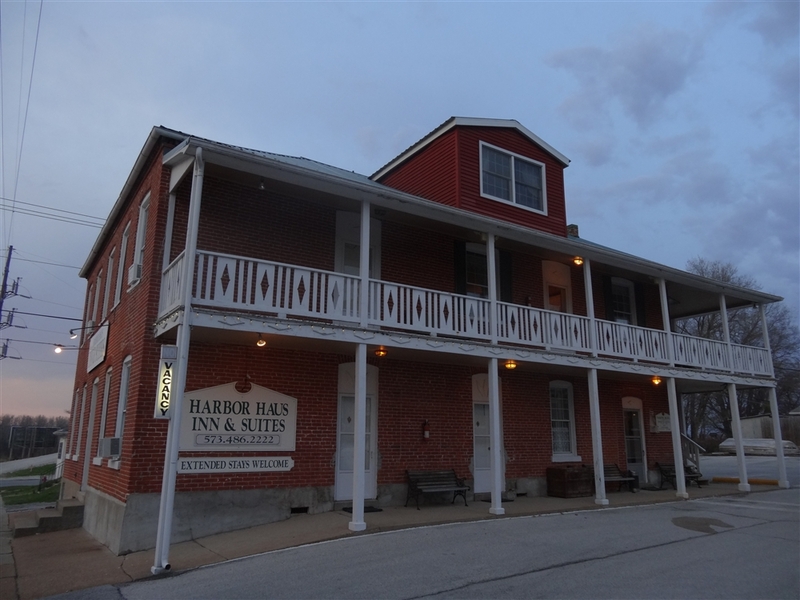 After roaming central Missouri for a whole long day (which you can read about it in the previous entry) the time came to find some place to stay overnight. So during one of our usual pit stops, when we refuel the car, stock up on coffee (for my girlfriend), cold coke with plenty of ice (for myself) and chocolate (for both of us), we opened our vast array of maps and started deliberating about where to go. It was then when I spotted the small town of Hermann located on the banks of the Missouri river, less than an hour from our current location. Somehow I remembered from one of the many guidebooks on the US I have read over the years that it was supposed to be a nice historic place. In fact Hermann turned out to be a real gem. Located about 80 miles west of St Louis it was established in 1837 by the Deutsche Ansiedlungs-Gesellschaft zu Philadelphia (German Settlement Society of Philadelphia) and named after Hermann der Cherusker, a Germanic leader who defeated the Romans in the Battle of the Teutoburg Forest in 9 AD (his mildly kitschy statue in the town was dedicated in 2009). 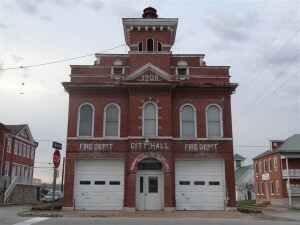 Nowadays this small place (population only about 2500) is a centre of the, so called, Missouri Rhineland. Located mostly in the Missouri River Valley this area is named for its similarities to the Rhineland region in Germany and for the German settlers who determined that this part of Missouri would be good for grape growing. 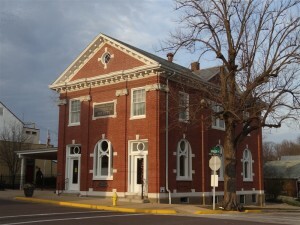 German influences as well as connections with Philadelphia are visible throughout the town. For example most of the historic buildings are constructed with bricks and they really resemble some of the Philadelphia’s old neighbourhoods. In fact Hermann has over 110 buildings listed on the National Register of Historic Places, many of them converted to lovely B&Bs and guest houses. We managed to get a really good price for a room in one of the inns in the centre of the town. It probably helped that we arrived mid-week and outside the main tourist season. During our visit the town was actually quite deserted but that suited us fine as we could see that it was the sort of place which gets swamped by visitors during the summer weekends. Instead we had its charming streets pretty much to ourselves. The following day we headed east towards Saint Louis, but we passed its downtown and went straight across the Mississippi River to one of its eastern suburbs (located actually in Illinois) to see one of the most unique sites in this part of the US, the Cahokia Mounds. This historic park is one of only 21 UNESCO World Heritage Sites in the United States and is located on the site of an ancient Native American city (c. 600–1400CE). 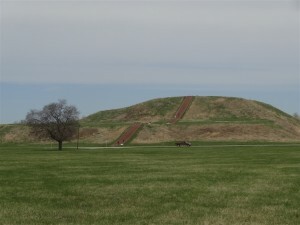 Cahokia was the largest and most influential urban settlement in the Mississippian culture which developed advanced societies across much of what is now the Southeastern United States, beginning more than 500 years before the European contact. At its peak in the 1200s it was among the largest cities in the world and its ancient population would not be surpassed by any city in the United States until the late 18th century. Today, Cahokia Mounds is considered the largest and most complex archaeological site north of the great Pre-Columbian cities in Mexico. Part of the complex is its fascinating museum displaying Mississippian culture artefacts unearthed during many of the archaeological digs as well as explaining what we know about this culture (not that much at all). But of course the highlight of the visit was the climb to the top of the Monks Mounds which apparently is the largest man-made earthen mound in the North American continent. From its top, located about 30 meters above the ground, you can see many of the 80 mounds which are part of the whole site. 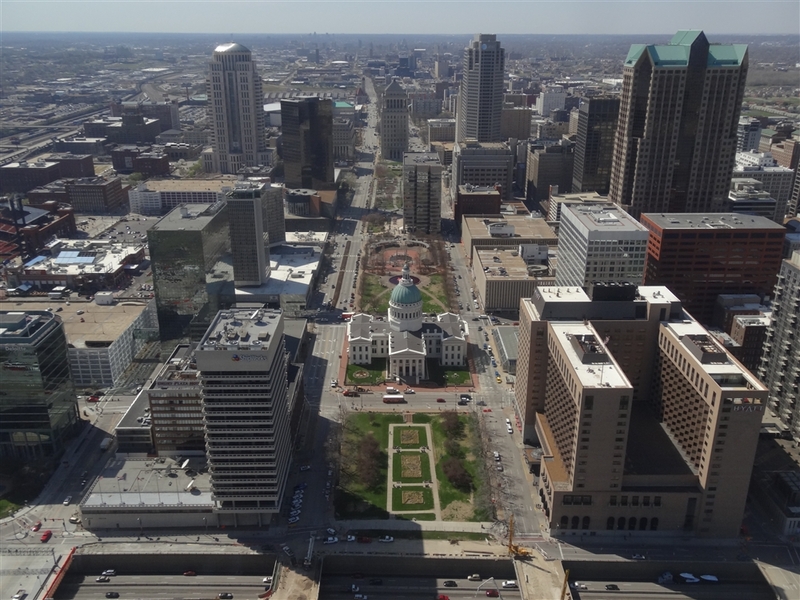 There is also a splendid view towards the downtown St Louis with its skyscrapers and the famous Gateway Arch well visible. And that’s where we headed next. Yes, it is super touristy, with security checks, a queuing system based on Disney attractions and bus-loads of schoolchildren but we simply couldn’t resist the idea of riding to its top. Also, let’s face it, as an engineering marvel it was really too strong a temptation for geeks like us. 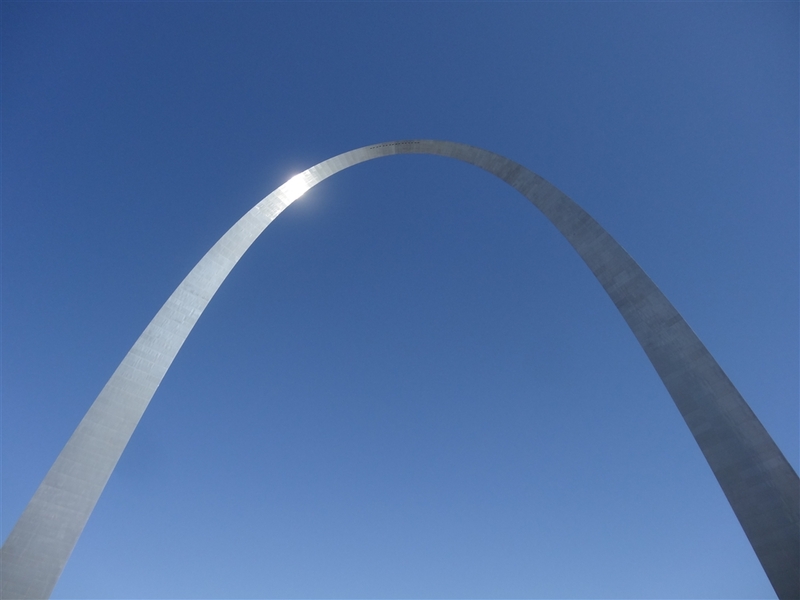 The arch is 192 meters tall (still the tallest arch in the world) and is part of the Jefferson National Expansion Memorial. It was designed as a monument to the westward expansion of the United States by the famous Finnish-American architect, Eero Saarinen who won the design competition in 1948. However construction only started in 1962 and lasted until 1967 when the monument finally opened to the public. Of course I have seen the arch in books and on TV but in reality it turned out to be way more impressive than I expected. It looked so light and fragile that it was hard to believe how it can stand at all. The structure is made of two layers of welded steel with concrete poured between them. The outside layer is made of shiny stainless steel and the arch has equilateral triangle cross-section. All this makes it really blend with the sky. Seriously, if you stand directly underneath and look up it practically disappears. To get to the top of the arch we had to ride in a strange and claustrophobic tram. Basically each of the absolutely tiny capsules seats 5 people and makes you feel like an astronaut during a launch as everything is shaking and making noises during the journey up. But the views from the top reward all the scary moments as well as the queues to the tram. To the east you can see the mighty Mississippi and to the west the downtown St Louis with all its skyscrapers, spaghetti junctions, baseball stadium and straight long avenues stretching towards the western horizon. It is really hard not to take plenty of pictures. After safely getting back to the ground level we wandered a bit around the downtown in search of something to eat and I have to say that it doesn’t really impress. I mean you can see some fantastic architecture (mostly from the pre-war period) but there isn’t much happening and the whole place looks way too quiet for its size and the size of the grand buildings. Or too big for the amount of people on the streets. Well, that is the price of suburbanisation, the US downtowns are way less lively than European cities of similar sizes. 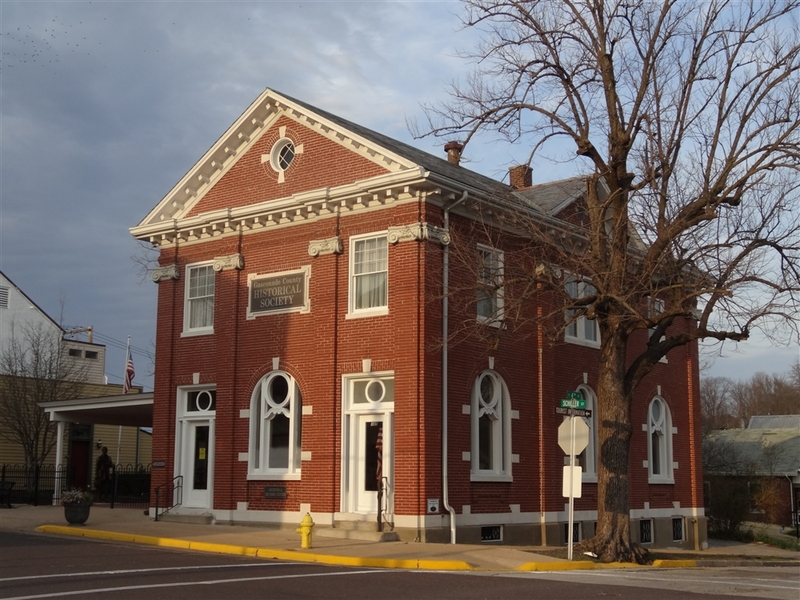 We decided not to spend the night in St Louis but instead drove about 60 miles south along the Mississippi river to yet another small historic town, Ste. Genevieve (named after Saint Genevieve, the patron saint of Paris). 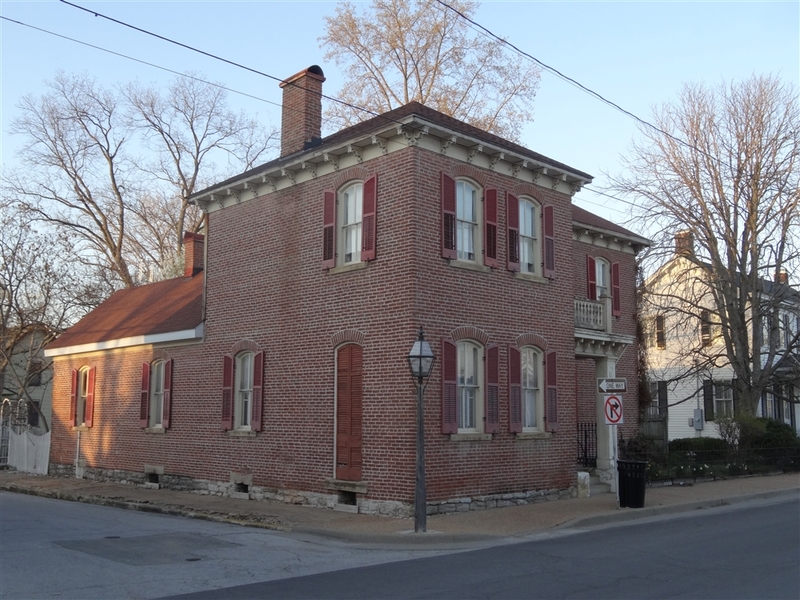 Founded in 1735 by the French Canadians it is the oldest permanent European settlement in Missouri as well as one of the oldest colonial settlements west of the Mississippi River. Similarly to Hermann, where we started our day, there are many old buildings giving this small town a really pleasant feel. However in Ste Genevieve the buildings are older. The oldest of them, described as “French Creole colonial”, were all built during Spanish rule. 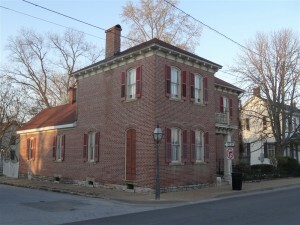 For example the oldest surviving buildings like Louis Bolduc House or the Bauvis/Amoureux House were constructed in the 1790s. Ancient by American standards. Like in Hermann we spent our evening leisurely strolling around the town photographing many of its historic structures. Unfortunately, unlike in Hermann, we didn’t manage to find reasonably priced accommodation in the town (arriving late on Friday didn’t help) and had to drive to its outskirts and book ourselves into characterless but cheap local motel. Still I found our stop in historic Ste Genevieve worthwhile and would recommend it to anyone (especially if you are interested in colonial history). 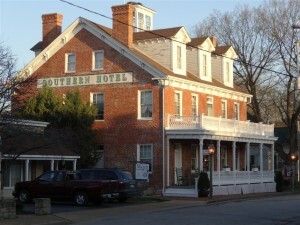 It was about to be our final night in the fascinating and varied state of Missouri as the South was calling us. I have to say that we really enjoyed the Show Me State. It offers a great mix of historic sites, varied landscapes, small towns and big cities. 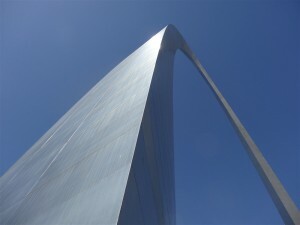 It is worth mentioning that apart from St Louis Kansas City (which I visited few years ago) is also located in Missouri. If you are looking for a real America, Missouri is one of the places where you can find it. This entry was posted in Uncategorized and tagged Cahokia Mounds, Gateway Arch, Hermann, Mississippian culture, Missouri, Missouri Rhineland, St Louis, Ste Genevieve on July 20, 2014 by admin.